Terry and Anne are religious door-to-door pamphleteers who think that artist's renderings are the real-deal. He's selling "Life Time Protection", as well as loft conversions. Terry bears a striking resemblance to "The Yorkshire Ripper", Peter Sutcliffe. 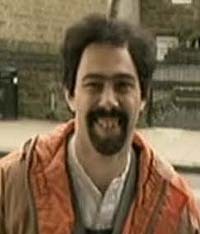 For another Peter Sutcliffe reference, check the Charlie & Stella Hull page. The Terry character is based on a true-life experience had by Reece. A door-to-door Jehovah's Witness showed him drawn illustrations and said that the bad stuff was in black and white whereas when everything was good it was in color. Anne travels door to door with Terry, trying to sell "Life Time Protection". She doesn't talk much. A young lady who is not fooled by hand-drawn illustrations passed off as photographs.